Materials: Burl bigleaf maple with with inlaid colored calcite crystals. Finished with metal-acid dyes and musical-instrument lacquer. 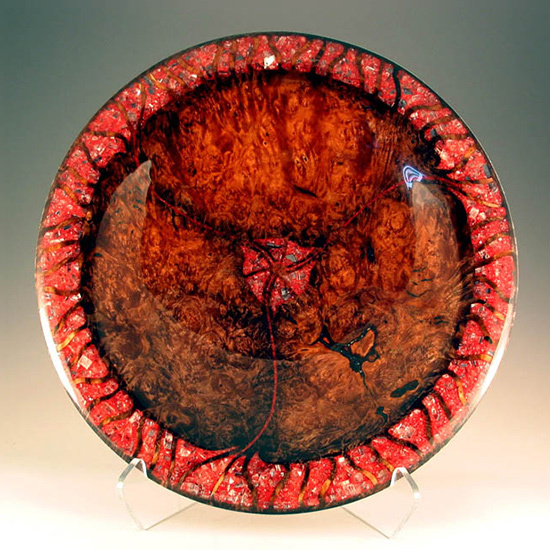 Comment: This is one of many translucent platter designs I have completed but remains a favorite. Exhibited at the Seventh Contemporary Wood Invitational Exhibit, The American Art Company, Tacoma, WA. In the Bernstein Collection.